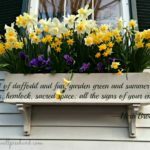 Last week for the first time I was on Nantucket off-season—to celebrate daffodils, one of the first signs of spring on the island. While South Texas is already experiencing summer, with the temperature occasionally reaching 90 and spring flowers past their prime, Nantucket is at the very beginning of springtime, with bulbs and fruit trees and forsythia in full bloom. I will return at the end of spring, in early June, when the tiny buds of roses and hydrangeas are not yet showing color and a few iris, lilacs and rhododendron are still blooming. By the end of June, the cottages and cliffs at ’Sconset will be buried under a riot of climbing roses, and in July the island will turn blue with hydrangeas. Even the hedges bloom. And it seems that every house has window boxes and a garden. After the long, cold, dark winter, Nantucketers move outside in summer. 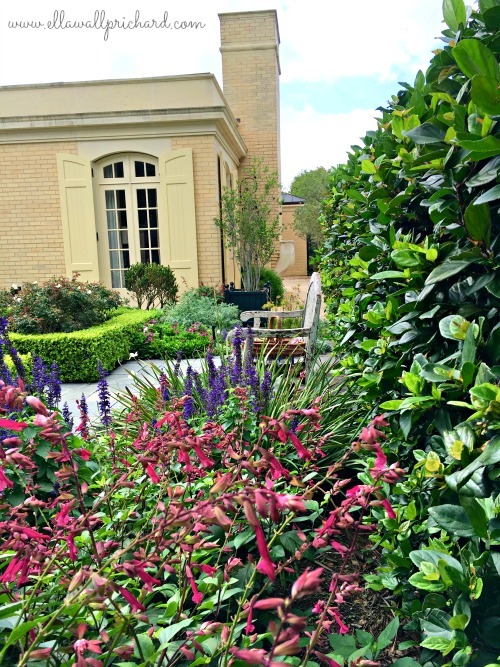 Their gardens, often hidden behind tall hedges, are truly outdoor rooms. My next door neighbors are an old Boston family who have probably summered on the island for generations. Their above-ground cellar holds all the water toys for the teenaged grandchildren, who head for the beach in the Jeep each day; and the fence around my air-conditioner is decorated with their wet beach towels. But at night the large three-generation family gathers in the back yard for dinner, and the faint sounds of their conversation and laughter drift up to my bedroom long after the sun has set. This is repeated nightly all over the island. In 60 days with no car, I walk down Centre Street more than 200 times. I know the gardens intimately. I notice as one flower fades and another bursts into bloom. I see gardeners everywhere, all the time. My landlady and I share the same property, with only a few square yards of grass. Still, two girls come three days a week to tend the window boxes, watering and trimming dying flowers. Mowers come on Monday; and those who prune, trim and weed the hedges and beds, on Wednesday. 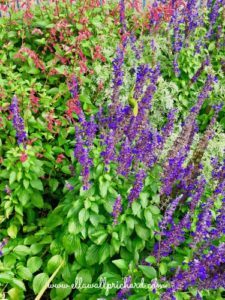 The beautiful gardens of Nantucket—enjoyed mainly in July and August—do not come naturally, easily or cheaply. Generally, they aren’t planted until after Memorial Day, when danger of frost is finally over. Clearly, flowers and gardens are another of the values of that community. When friends and family visit me, they marvel most of all at the flowers. “Why can’t we have flowers like this?” they ask, mourning our hot summers. It’s a question I have asked myself repeatedly during my daily strolls. I think I have the answer, which I first blogged about almost two years ago here. Because of our 10-month growing season, we are lazy. 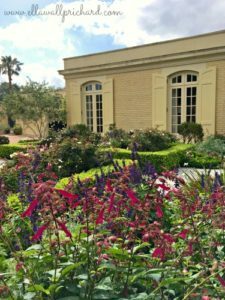 We want our gardens to look good year round. We want to stick plants in the ground and have them look good all the time with no effort. We have no concept of a dormant season, of deciduous plants. 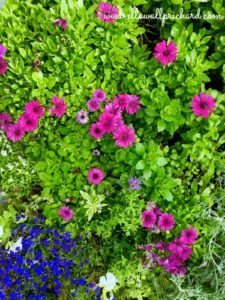 For the most part, we can’t grow the same flowers that New Englanders grow; and when we do, we generally plant them around Thanksgiving and enjoy their blooms until April or May. Even with one hard freeze this past winter, I have had plants in bloom nonstop. Only those who have swimming pools entertain outdoors in summer. It’s too hot. From October through April—though January and early February are iffy—we can entertain outdoors. That’s when we need glorious gardens. Nantucketers may have daffodils, tulips, climbing roses, blue hydrangeas and Rose of Sharon hedges; but they would surely envy our riot of color from bougainvillea and oleanders, hibiscus that don’t freeze in winter and roses in March. Don’t plant rows of a single color or variety of plant. Mix height and color. Don’t plant everything to reach peak bloom at the same time. Always have a mix of buds, full blooms and fading plants. As one variety dies, other plants will grow and fill the space. Since summer is a season in which we struggle to keep plants alive and to fight insects, mildew and weeds, I have decided it will be my dormant season. I have a good foundation of green plants—mainly viburnum and boxwood, shady areas overgrown with Boston fern. As the snapdragons, stock, petunias, alyssum, lobelia and impatiens wilt, I am not replanting with summer flowers. We are pulling them up, treating the soil with pre-emergent weed seed killer and covering it with a thick blanket of pine straw. The low-maintenance knockout roses have been lightly pruned and fertilized to get another round of blooms this month. Then they will be ignored until fall. Shrubs and hedges were pruned early; I don’t want to encourage summer growth. Aspidistra is often the plant of choice in Corpus Christi for gray foliage, but it grows rampantly and takes over the garden. 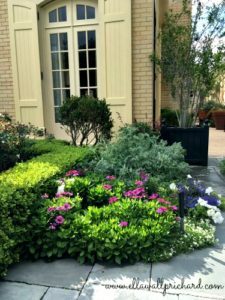 I have noticed that both in Dallas and Nantucket, they use Dusty Miller more often, planting small plants with pansies for example, for winter and early spring bloom. As the winter flowers fade, the Dusty Miller grows and fills the space. I have good luck with Dusty Miller, but I have never used it to complement other plants. A recent article in the New York Times, Understanding What Makes Plants Happy, sounds silly but makes sense, and I think it’s what Nantucket gardeners instinctively do. In fact, I think it happened accidentally in some of my most successful flower beds this winter. Some plants are sociable, and they want to spread toward other plants, while other plants are loners. 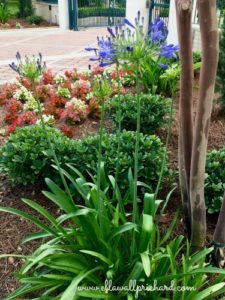 By mixing taller “loners” with sociable, low spreading flowers like alyssum and lobelia, we can create a blooming carpet under our specimen plants, which serves as a living mulch, crowding out weeds. I will let you know what happens. I regularly post garden pictures on my Facebook page. Click the “like” button there if you want to follow my progress. Wondering what a garden memoir has to do with widowhood? I have returned to gardening—an old hobby—since Lev’s death; and it has brought me great satisfaction, even joy. Like cooking, entertaining and travel, gardening is a happy part of my single life. 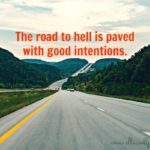 Sometimes I enjoy departing from the more serious aspects of grief and widowhood to write about my lighthearted moments.